Ritmos Latinos is an organization at the University of Arizona that promotes latin music and dance to U of A students and Tucson salsa enthusiasts. 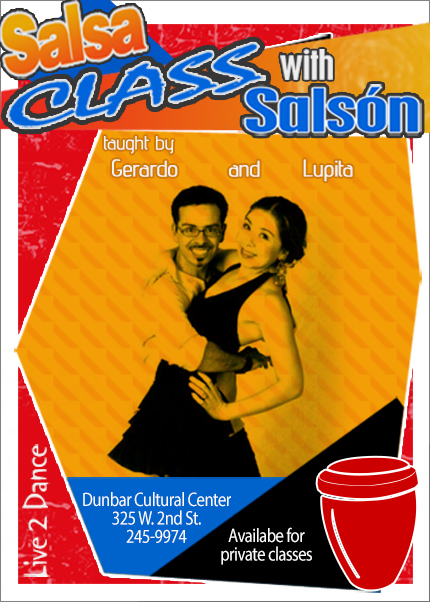 Specifially, Ritmos Latinos promotes a form of Cuban dance style called Casino, or Rueda de Casino. Visit www.ritmoslatinos.org for more information. This class is designed to start developing and building the foundation in your body necessary for the many layers of expression possible in your dancing. At this Introductory Level, we start from ground zero and slowly work through some basic elements that are key to more expressive movement, both in partner and solo dancing. The work done in this class is typically a long term, on-going process of years, so let's get that started! We'll be focused strictly on body movement, isolations, coordination, control, rhythm, designed with Salsa and general Latin genres in mind - but this fundamental body movement absolutely translates to dance genres outside the latin realm. This is not a class for partner work or choreography. We will go as deeply into the body and movement as you are willing and open to on an individual basis. I encourage you to arrive early to stretch on your own, preparing your bodies for the work you'll be doing in class. Dance shoes, tennis shoes and bare feet are all fine for this class. This class assumes you already have a good, basic foundation down. *Please note, this is not an Introductory Level class. Make sure you're already comfortable and confident with the basics, otherwise you'll be lost! This is a class for beginners who have some experience, or anyone who desires to refresh beginning level moves. No need to have a partner to take the class. We rotate partners so that you get a variety of experiences dancing with different leaders or followers. Couples who attend the class can stay together if they prefer. The material we cover is progressive, building upon each previous week. Please feel free to video record to reference and help you practice and keep it in your minds and bodies. *If you need to work on foundations like the timing of your basic steps, cross body leads, basic right hand turns, etc., please schedule some Private Lessons with me to catch up, or, take an Introductory Level class first. Wear shoes that are not overly grippy, preferably light with slick bottoms so as not to create friction, especially when you turn. Please register now. A minimum number of students is required to hold the class and is subject to being canceled if minimum isn't met, in which case you'll be refunded. Email: info@MelissaAlejandra.com for registration.